This entry was posted on 11th November, 2017 by . If you have been to Miami International Airport since October 27th, maybe you have had the pleasure to see this exhibition for yourself. With Knitting as Poetry, artist Evelyn Politzer expands our appreciation of fiber arts and the techniques of knitting and crochet as artistic forms. Her creative expression offers a bridge between the history of craft and “women’s work” and present concerns regarding the natural environment. Malabrigo had the pleasure of sponsoring this exhibition by donationg all the materials used to create these wonderful works of art. This entry was posted on 1st April, 2016 . The latest Book of Vickie Howell it�s already on sale, Wee Garter Stitch: Must-Have Knits for Modern Babies & Toddlers. This is a good news for us because we are part of it through the beautiful "Poncho Pal" made in malabrigo Worsted, Mariposa color. Poncho Pal by Vickie Howell, Worsted, Mariposa color. This entry was posted on 9th September, 2015 . Some lovely Finito�in Archangel makes an appearance in Megan Goodacre's new book,�"Idiots Guides: Knitting Sweaters"! A great choice for a newbie sweater knitter (even if they're not idiots, hehe.) The Seamless Cardi features easy top-down construction with a little bit of shaping and some charming pocket detail, for a super adorable result. This entry was posted on 26th August, 2015 . The new Knitscene Fall 2015 magazine is out, featuring�Caen Cowl�by Deborah Helmke, designed using Malabrigo Yarn Chunky on the cover! This long, looped cowl is the perfect brioche project for beginners. Worked from end to end in the most basic of brioche stitches, this squishy cowl is seamed and has fringe added for a chic, cozy accessory. This entry was posted on 21st April, 2015 . We want to share with you the work of�Amy Micallef, an excellent designer that has worked with malabrigo in several of her prettiest�designs. In the Winter 2014/15 edition of Vogue Knitting you can see the Shawl-Collar Cardigan, a beautiful sweater from Broadway play "Of Mice and Men", with James Franco and Chris O'Dowd, made with malabrigo Sock in Ochre color. Shawl-Collar Cardigan by Amy Micallef | Sock in Ochre color. "Amy Micallef captures timeless style in her shawl-collar cardigan, crafting it with impeccable attention to detail. She work the cable rib collar along with the front, transposing the right and wrong-side pattern stitches so that the right side shows where it folds over at the yoke. The wide cabled rib border nips the waist and cuffs and harmonize with the charming allover pattern of eyelet blocks. Malabrigo yarn Sock offers a bit superwash luxury"
Also Amy is the author of�Pinebank,�the cardigan featured on the cover of the our newest Malabrigo book 8,�In Central Park. In this cardigan the perfect combination of bright colors, tiget lily, fl�o, very berry and cadmium, enhance the blanced tones of Azules yarn. The garment enchant us for great details like the ends of the sleeves, or the internal colors finished. Pinebank by Amy Micallef | Merino Worsted | Azul profundo, Tiger lily, Fluo, Cadmium and Very berry colors. This entry was posted on 27th February, 2015 . These days we received the excellent news that malabrigo has made the cover of a new book by Kristin Omdahl! Bleeding Heart it's a beautiful shawl featuring 3 skeins of malabrigo Lace in Verdes. We love it! Kristin says us about this elegant shawl: "This delicate laceweight yarn has added structure and textural interest with the blending of large-scale broomstick lace and motifs for a beautifully scalloped border to this otherwise simple crochet lace shawl. The motifs are crocheted separately and joined to the bottom-up-construction shawl with the addition of a simple mesh border/panel for an easy, sew-free joining." This entry was posted on 7th October, 2014 . Is the first time that malabrigo is present in Pompom quarterly issue, so we want to share the good news with all of you. In their last number the designer Sarah Heys has created a "robust and beatiful" cowl, named Kallista, with our superfine Merino wool,�chunky, fucsia color,�and our lace,�used to embrodery detail in Buscando Azul and Black colors. And how behind every design there is a story to be told, we share a text written for the designer: " We like our cowls robust - they need to be able to stand up to wind and rain. We also like our cowls pretty, so it�s lucky that Kallista is both clever and beautiful (like one of our favorite country music stars!)" This entry was posted on 29th September, 2014 . Interweave has used the�Malabrigo�Silky Merino, a�soft blend silk and baby merino wool, in their recent�issue of�Unofficial Downton Abbey Knits 2014. In this number you can see a beautiful and stylish scarf, Night-on-the-Town Herringbone created by Annie Modesitt. "You'll love these stunning projects, perfect for men, women, and every day life in this special issue of�The Unofficial Downton Abbey Knits!" This entry was posted on 16th August, 2014 . The new Interweave Knits Gifts 2014�it's ready for us to enjoy!,�malabrigo is part of this issue with two of their characteristic yarns used to create two hats patterns, both really nice. One is "Backroad Hats", an Elizabeth Elliot design made with Merino Worsted (#36 pearl), you only need 1 skein to achieve. The other is a Nancy Shroyers design called "Stashbuster Hats", this was made with several colors of malabrigo Sock yarn: archangel (#850, orange variegated, A) and alcaucil (#805, dark green, B), 1 skein each, and alcaucil (#805, dark green, A)�and alcaucil (#805, dark green, A) and�ochre (#803,�B), also 1 skein each. If you want more details of these cute and warm hats, you should visit the latest�Interweave Knits Gifts.�We suggest you start now, that way you'll be get on time with the winter gifts! This entry was posted on 20th June, 2014 . From the front, a cropped cardi. From the back, a hip length sweater with a neat overlapped yoke. Bet you have to look twice to figure it out! Interestingly, this sweater does not use any short rows. All that crazy shaping comes from increases and decreases setting the sides on bias! Then, to fill in the low back, the front border is knit out and grafted in. It's designed for Malabrigo Rastita, showed in the colourway Dewberry. Instructions come for seven sizes, and you will need between 900 (3 skeins) and 1800 (6 skeins) yards of Rastita, depending on the size you make. For more information, visit the pattern page on Knitty or Ravelry. This entry was posted on 3rd June, 2014 . The Interweave KnitScene Accessories 2014 edition has hit the magazine stands and features a pattern knitted with Malabrigo. The pattern is Peacock Ascot by Simone Kereit. It uses 2 skeins of Silky Merino in 412 Teal Feather Colorway.� Silky Merino is our DK weight half silk - half merino yarn. In this color it�mimics the sheen of bird feathers, while a simple stitch pattern evokes the idea of peacock feathers. Pair with some eye-catching buttons for added oomph. This entry was posted on 15th May, 2014 . Malabrigo is part of the 2014 Spring/Summer edition of�Amirisu, an�online magazine from Japan, published in both�Japanese and English�languages that brings together the best of Japanese and overseas knitting scenes with really eclectic content. � � � � � � � The pattern knitted with Malabrigo is�Mokoshi�by Nest Design Laboratory. It's a pullover with peplum silhouette, perfect top for springtime, and we totally love it! Mal Spotting: Stitch Seekers Edition One and Giveaway! This entry was posted on 11th March, 2014 . Eat Cake by Rhiannon McCulloch in Chunky, Water Green colorway. Clan Westwood by Deborah Moore in Worsted in Strawberry Fields and Sweet Grape colorways, and Silky Merino in Madre Perla. Crop Fop by Rhiannon McCulloch in Chunky in Water Green colorway. This entry was posted on 14th January, 2014 . Interweave releases today their new issue of Knitscene for Spring 2014. One of the designs, called�Sign of Four Scarf by Annie Watts is knitted with Malabrigo Yarn Silky Merino. This entry was posted on 23rd September, 2013 . Interweaves magazine Knitscene for Winter 2013 is out on it's online version on Sept 23rd, featuring a design for Malabrigo Yarn Arroyo. This entry was posted on 1st August, 2013 . Malabrigo Yarn is part of Interweaves new edition of Knits for Fall 2013. The pattern is called�PRISMA DOLMAN by Mercedes Tarasovich-Clark and is a �beautiful sweater knit using Malabrigo Lace. This entry was posted on 20th June, 2013 . Crochet! Defining Crochet magazine has it's autumn 2013 edition out containing two designs made with Malabrigo Yarn, one of which made the cover ! These are two designs that will definitely make a great adition to your autumn wardrobe and shows really well how beautiful and elegant crochet can be. This entry was posted on 20th May, 2013 . This entry was posted on 5th February, 2013 . � These short finger gloves were designed for Malabrigo Yarn Lace, using colourway Marr�n Oscuro (#181) in the sample. It has a very delicate cabled cuff, and beautiful lace design on the back of the hands, making for a fun and interesting knit. The magazine will be out on its printed version on February 19. It has instructions for sizes�30� (32, 35�, 39, 42�, 46�)" bust circumference. The size shown in the picture is size 30�. This tank was made using Malabrigo Silky Merino in the colourway Cumparsita (#869). Depending on the size you will make you will need�6 (6, 7, 8, 9, 10) skeins. This entry was posted on 30th November, 2012 . There is a new version of Interweave Crochet Magazine, released today in it's online version. The magazine will hit the�news-stands�on December 18th. In the magazine you will find this nice top called �Quartz Lace Top designed by Dora Ohrenstein, designed with Malabrigo Yarn Lace. This entry was posted on 11th November, 2012 . This entry was posted on 7th November, 2012 . Interweave Crochet�Accessories 2012�has hit the magazine stands, and in it you can find the Tahitian Shawl by�Sigrid Arnott. This entry was posted on 6th October, 2012 . Interweave KnitScene Winter 2012 is out today in it's online version and if features two patterns done with Malabrigo Yarns. The first one is a fun, young,�cosy�hat. It promises a quick satisfying knit, and as a result you'll have something warm and trendy to wear this next winter, or maybe give away as�Christmas�present. Yes, Christmas is right around the corner, it's time to start planning! This entry was posted on 15th September, 2012 . Swingy and fitted this fun vest is a versatile tunic length garment. It can be worn over a sun dress on a chilly summer evening or with a turtleneck and skirt in the winter. The bodice is fitted and flattering. Deep ribbing hugs the core and enhances the bust and waist shaping. The lower half flairs out below the hips. The Deep-Rib vest can either be worn open at the front or closed with a shawl pin at the waist. Wear it with the collar up or folded back. There are plenty of styling options for this garment! 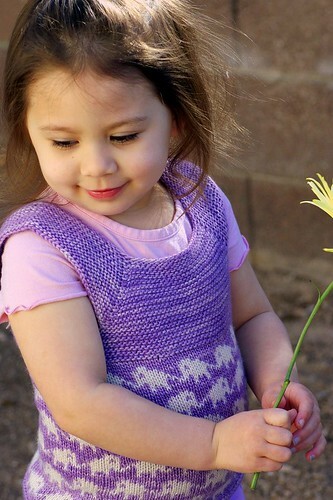 To make this vest you will need��4 (4, 5, 6, 7) skeins of Malabrigo Yarn Worsted. This entry was posted on 5th September, 2012 . This entry was posted on 25th August, 2012 . "Crochet chevrons morph from one color to the next in blends that transform a handful of tones into a rich autumnal swath of color. Occasional lacy rows lighten the crochet scarf for easy wear. This crochet patterns is easy enough for a beginning crocheter." This entry was posted on 20th July, 2012 . � Malabrigo Sock- #802 terracotta, 1 (2) skeins for�TRAVELER�S SOCKS�by Stefanie Bold. This entry was posted on 22nd June, 2012 . ���Malabrigo Merino Worsted - #610 red mahogany, 5 (6, 7, 7, 8) skeins for�Terra Linda Cardigan�by Rosemary (Romi) Hill. This entry was posted on 7th February, 2012 . Amber Waves, by E. J. Slavton[/caption] The skill level needed to knit this pattern is Intermediate. It comes in sizes�35� (39, 43, 47, 51) �''. You'll need�1125 - 1775 yards of Malabrigo Yarns Rios to complete this project, depending on the chosen size.�Be sure to get enough yarn to complete your project since each bag is a different dye lot, and skeins may vary from bag to bag. In some colourways the skeins may vary one from the other even within the same bag. To ensure random color distribution, we recommend that you knit your project alternating a few rows from two different skeins at once. This entry was posted on 29th November, 2011 . Malabrigo Merino Worsted, #61 butter, 2 (2, 2, 2, 2, 3) skeins for�Petite Facile Pullover by Meghan Jones. This entry was posted on 20th November, 2011 . Knitcircus Magazine Winter 2011-12, Issue 16 is out, and it features a beautiful cowl called Sprite, designed by Lynn Hershberger. It's knitted using one skein of Malabrigo Rios, colorway #412 Teal Feather. In the words of the designer: "The energy and fun of a zigzag pleases me. Over the ages, all cultures have enjoyed using this motif as a way to embellish, decorate, and entertain. There is an energy which comes from a diagonal line which draws me in, and I become more intrigued as I play with its possibilities. I named this Sprite for the agile energy associated with the word. Webster says a sprite is an elf or fairy. I�d like to feel that chipper on a cool winter day, and I think this collar may just help that goal!" This entry was posted on 29th October, 2011 . [caption id="attachment_1793" align="aligncenter" width="342"] photo by Caro Sheridan, in association with the BHK Cooperative[/caption] Have you seen the recent release by BHK Cooperative? BHK is made up of designers Elinor Brown, Amy Herzog, and Kristen Kapur. Kristen has a pattern in our upcoming Book 4 (still in production), but we thought we'd show her a little love for her new pattern collection, too! You can purchase the beautifully photographed collection on Kristen's website here, or through the BHK Cooperative website. The pattern featuring Malabrigo Yarn is called �Revere House, and is shown in our Twist base. The photos are by Caro Sheridan. This entry was posted on 28th October, 2011 . Malabrigo Chunky, #96 sunset (MC), 1 skein; #68 violetas (CC), 2 skeins for�Conch Scarf by Jody Witt. Knitter's Review, a website that compiles many useful reviews of products, yarns, and pattern collections, recently reviewed the October 'Harvest' E-Book from MFPP by Nichole Reese! Head on over and check out their kind words, and then maybe pick up a copy of the e-book yourself here on Ravelry. It's a gorgeous collection! This entry was posted on 17th October, 2011 . This entry was posted on 16th October, 2011 . This entry was posted on 11th October, 2011 . Malabrigo Lace, #158 cognac, 2 (2, 2, 3, 3, 3, 3, 4) skeins -�Nevis Cardigan by Stefanie Japel. Malabrigo Chunky, #74 polvoriento, 7 (8, 9, 10, 11, 12, 13) skeins -�Bermondsey Cardigan by Stefanie Japel. This entry was posted on 3rd October, 2011 . If you were lucky enough to attend the fashion show at Stitches Midwest 2011, you'll have seen this gorgeous cardigan rushing towards you down the runway. Crocheted in Malabrigo Arroyo colorways 'Glitter' and 'Prussia Blue', the cardigan highlights some awesome top construction panels, a great fit, and fabulous drape. But could we expect any less from crochet designer Linda Permann? You can purchase the pattern on Ravelry, available now! This entry was posted on 6th September, 2011 . This entry was posted on 5th September, 2011 . We've been interviewed! Marcela Zappi visited the mill and interviewed Antonio. natural, soft strands of Merino. Eventually, this will form several types of Malabrigo yarns....."
To read all the review from�Marcela Zappi�go�here! This entry was posted on 4th September, 2011 . Malabrigo �Lace� (100% baby merino, approx. 470 yds (430 m) / 13?4 oz (50 g)): approx. 7 (83?4-83?4) oz / 200 (250-250) g Polar Morn, approx. 31?2 (31?2-51?4) oz / 100 (100-150) g Indigo, approx. 13?4 (13?4-31?2) oz / 50 (50-100 g Continental, approx. 13?4 oz (50 g) each of Rhodesian and Rich Chocolate; KnitPro needles US #3 (3.25 mm), KnitPro needle set US #3 (3.25 mm), KnitPro circular needle US #3 (3.25 mm), 47� long; 10 dark gray buttons, �5?8� (15 mm). 38 sts and 32 rows Fair Isle pat, worked with needles US #3 (3.25 mm) = 4� (10 cm). Moroccan zellige were the inspiration for this gorgeous jacket. The bottom and sleeve pattern is easy to remember, but the bodice will engage your full attention! This entry was posted on 22nd July, 2011 . These adorable lace knee-highs are made out of Malabrigo Lace in Pearl Ten and Pagoda! Can't you just imagine them with all your favorite pairs of winter tights? 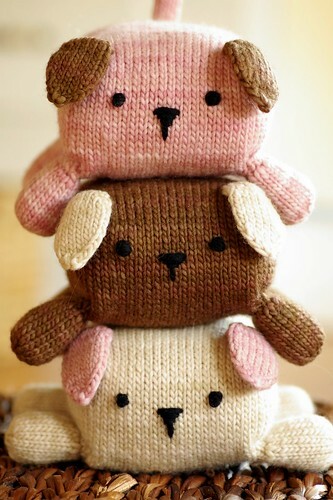 They're featured in the Fall 2011 issue of Interweave Knits, and are designed by the talented Rebecca Blair. The knee high pair is in Pagoda and takes 1-2 skeins. The thigh-high pair is in Pearl Ten and takes 2-3 skeins of Lace. These are a great addition to your winter wardrobe in a spectrum of colors! This entry was posted on 21st July, 2011 . This entry was posted on 20th July, 2011 . The new issue of Crochet! Magazine has a couple of gorgeous Malabrigo patterns in it. Be sure to check out the lovely Glacial Skies Coat by Shannon Mullett-Bowlsby, made with our Merino Worsted in Polar Morn, and the Loop-D-Loop Jacket by Ann E. Smith , made in Silky Merino, colorway Atardecer. "What Would Madame Defarge Knit" (with Malabrigo)? This entry was posted on 26th June, 2011 . She would knit this fantastic cowl out of Malabrigo Sock, of course! We are so excited to tell you about another book appearance, this time in a recent Cooperative Press release, "What Would Madame Defarge Knit?" This book is a collaborative tome with designs from a baker's dozen of talented folks, and all the designs are themed around unique characters from classic literature. Erica Hernandez's pattern is Bertha's Mad Mysterious Mobius, a lace mobius cowl in the ever-gorgeous Ravelry Red shade of Malabrigo Sock. It is based on the character of Bertha Mason, from Jane Eyre's story, The Madwoman in the Attic. The book is available to order on the Cooperative Press website. This entry was posted on 22nd June, 2011 . Author Tricia Drake, who has published patterns in such magazines as Spool and Living Crafts, has released a book of baby knits, many of which are made from our Gruesa and Worsted yarns! We are honored to be featured in at least four patterns out of the twenty in Welcoming Home Baby the Handcrafted Way, and many of the other patterns are well-suited for our other yarns, like Chunky, Rasta, Aquarella and Rios! One reason this book is so exceptional is the versatility of the patterns - many of the newborn cocoons double as hats, and the blankets and hooded capes (used to swaddle and warm newborns) can double as snuggly friends and costumes well into toddlerhood. These knits are so quick and tiny that even the most novice of knitters will be able to grasp and work through the concepts and designs quickly, resulting in a plethora of fun, funky, baby knits for the new mom, eager friend or family member looking to make something really special and unique. Do you have a book that features Malabrigo? Send a press kit (including photos and description) to submissions@malabrigoyarn.com -- we would be pleased to talk about the patterns in our yarns on our blog! This entry was posted on 26th May, 2011 . A beautiful tunic top features our yarn in the Early Fall 2011 issue of Vogue Knitting! The Bobble Tank Dress features our Malabrigo Lace, held together with two other yarns to get a beautiful fabric with a lovely halo. This design is by Monica Hofstadter, patterned for four sizes. This entry was posted on 7th May, 2011 . It is with great delight that I can present you with another book in our Malabrigo Freelance Pattern Project series! May's E-Book is a delicious collection of shawls and shawlettes by the talented Tori Gurbisz of Lachesis & Co. Her work is really impeccable -- clean, neat, and beautiful, with amazing charts and a great flow throughout each pattern. I can't wait to knit some of these shawls myself, especially Amalthea! If I felt more confident with lace, I would attempt Daphnaie, but the edging looks like it would be incredibly challenging (though I'm sure Tori's directions are more than adequate to get through it! This collection is based off of several characters in various myths and fairytales from books, legends and stories. As much as I loved looking through these patterns, I almost loved reading about the inspiration for them more!�As always, Tori's designs are available through her Ravelry Designer Page: Lachesis & Co. We are so proud to support beautiful work by independent designers! This entry was posted on 29th April, 2011 . Malabrigo Organic Cotton, �#OC710 Turquesa, #OC716 Vicu�a�-�Amelia Hoodie by�Erica Jackofsky. This entry was posted on 17th April, 2011 .
admired the buttery soft merino wool and chose Stonechat as my first colorway. I knit a pair of fingerless mitts, but the second mitt ended up much tighter than the first. I must have been more tense while knitting that second mitt or accidentally knit with a smaller needle size! However, this rookie mistake didn't deter me from knitting with a lot more Malabrigo for future projects and designs. What was your first Malabrigo design? The Botanic Hat was my first design using Malabrigo Yarn. It's a two-colored beanie and I chose beautifully natural shades of Malabrigo Worsted for the final version. The striped hat is quite addicting, so I knit at least 6 Botanic Hats with various color combinations. Why Malabrigo for so many of your designs? I love the color choices and the yarns are a pure pleasure to knit with. I often start with a yarn when designing new patterns, rather than sketching the design and finding a yarn to match. I'm very inspired by fiber content, texture, and color. Malabrigo is also available in many local yarn stores and I try to support the local shops whenever I can by using yarns they carry. What is your favorite personal project in Malabrigo to date? My first final version of Daybreak in Boticelli Red and Chocolate Amargo. I love red and brown together, especially in those colorways. The shawl now belongs to one of my best friends, Christine, in London. She wears it all the time and I've even repaired a small hole in the scarf -- the sign of a truly loved piece of knitwear. Do you have a favorite colorway? Mmm, we're playing the favorites game, eh? Twist and Sock are my most favorite Malabrigo yarns. Azul Profundo and Manzanilla Olive are my two favorites in Malabrigo Twist. Eggplant and Persia in Malabrigo Sock, and Frank Ochre in Malabrigo Worsted. Stephen has self-published two excellent collections -- West Knits Book One and West Knits Book Two. In addition to several single published patterns, he has also done work in Malabrigo Book Three and the upcoming Malabrigo Book Four (in production). We are honored and excited to have so much work in our yarns in Stephen's extensive catalog. This entry was posted on 16th April, 2011 . Follow us by clicking the Twitter Bird above! If you have a twitter account, come over and follow us! I will be posting to the account whenever there's a new blog post, something cool found on Ravelry made of our yarns, or a Malabrigo event is coming up! We'd love to see what you're making and hear what you're doing, too! @MalabrigoBuzz is our Twitter name! This entry was posted on 31st March, 2011 . This entry was posted on 15th March, 2011 . About.com did a Knitting Reader's Choice awards for 2011 and announced us winner of the Best Wool Yarn category! We are so proud and pleased that Malabrigo Worsted was chosen! If you would like to read about the contest, the list of voting breakdowns and such, please check it out here! About.com also has an amazing yarn review of Merino Worsted! Thank you again for your support and love regarding our products -- we love to make them almost as much as we love to see people happily crafting with them! This entry was posted on 2nd March, 2011 . An intricate panel adds character to a simple ribbrd vest. Try it in a stunning handpainted monochrome for serene beauty. This entry was posted on 8th November, 2010 . This entry was posted on 5th November, 2010 . Malabrigo Book 3 is still pretty far away from a wide press release, and you won't be seeing it on your yarn store's shelves for awhile, but we thought we'd give you a little teaser preview. This was a very exciting project for us to work on, and is one especially dear to me since I got to be Styling/Project Coordinator for Book 3! I worked closely with the stylist to choose all the outfits and the direction of the photoshoot, and with Antonio to choose the perfect model and location. Let us know what you think, and which patterns you're getting excited for! This book features patterns from a wide range of really excellent designers, and we can't wait to introduce it to the world. We don't have a release date yet, and these are not the official book pictures, but we will let you know as we get more information! This entry was posted on 18th October, 2010 . This entry was posted on 31st August, 2010 . Recently, Tobias was interviewed at the Icelandic Gardening, Knitting, Gradstudent, Mom blog! Not only was he interviewed, but �l�f, the author of the blog, also reviewed one of Malabrigo's newest colorways - Garden Gate - in our Merino Worsted. Please head over and take a look at her blog, read the review and the interview, and enter her (limited time only) giveaway to try and win a skein of Malabrigo for yourself! Malabrigo Silky Voted "Best Yarn"
This entry was posted on 26th August, 2010 . Bestcovery, the website that helps you discover "the best of everything", recently announced their top picks for 'Best Yarn', and Malabrigo Silky was right at the top at #2! So why is Silky their favorite? "Why it's a best pick: This yarn is half silk and half baby merino wool, sold in 50 gram skeins.� It comes in a rainbow of colors, including solid and variegated colors.� The "Pradera" colorway is a beautiful blend of blues and greens that is reminiscent of an underwater scene or a cool garden.� The baby merino wool provides softness and warmth, while the silk provides a slight shimmer.� It is a beautiful single ply yarn that is perfect for shawls or elegant sweaters.� These colors vary significantly from one dye lot to another, so make sure that you buy enough for your project." So grab a skein of Silky, if you haven't already, and see what all the fuss is about! Interweave Knits featured our Rasta yarn in their special edition Weekend Knits 2010! One of the staff knits -- projects designed by Interweave staff members -- included a triangular carry-case for your smaller sock or mitten projects! This would be the perfect project to take with you on a train or subway, or even to carry around with you at the local wool festival this fall! Interweave Knits' Weekend Knits 2010 will be available on newsstands on September 23, 2010. This entry was posted on 16th August, 2010 . Check out this gorgeous vest crocheted in Silky! 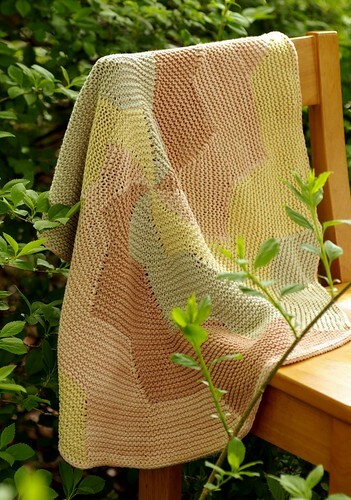 It will appear in the Fall 2010 issue of Interweave Crochet magazine! Howling Winds Cowl - New Pattern! This entry was posted on 23rd July, 2010 . The Howling Winds Cowl has finally been released! Start looking for it at your local yarn stores next month, as copies can be obtained through their rep and are free with a purchase of a skein of Rasta. The pattern is made in exactly one skein of Rasta in Solis, but would look good in any of Rasta's colorways. It knits up quickly and is a great gift for yourself, or anyone who lives in colder climates! If you have already purchased a skein of Rasta, but still want to knit the cowl, the pattern is available! This entry was posted on 16th July, 2010 . We already featured this gorgeous hat in one of our project mosaics, but be sure to look for it in your latest issue of Interweave Knits, too! This entry was posted on 11th July, 2010 . We really love to see our yarns knit up -- it is always amazing when someone chooses one of our colors or yarns for any project. After all, knitting isn't just about instant gratification. The garments that people knit, crochet, create, are heirloom pieces. They'll be used again and again, and seen by many people as an example of your hard work and craft. Recently, we've decided to feature some of our favorite Malabrigo bloggers - folks who regularly make lovely projects out of our yarns and help introduce them in the most beautiful of ways to friends, family, and other crafters. One of our favorite blogs is written by the sister team Alice and Grace, of KathrynIvy. And they even agreed to let me interview them! What was your first project using Malabrigo? What yarn did you use, and in what colorway? Do you remember what drew you to the skein? 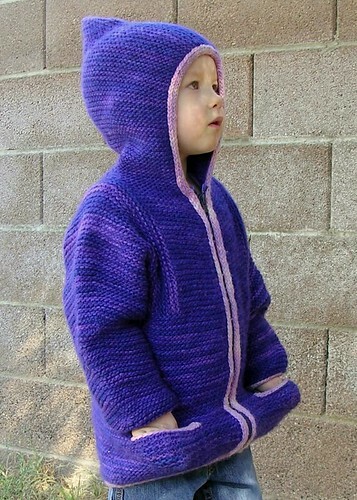 Alice: My first project with Malabrigo was a Tomten Jacket for my daughter using worsted in Purple Mystery and Orchid. The colors were perfect for a toddler! �Camdyn got so much use out of that jacket because it was so soft and cuddly. She wore it until it was way too small for her. Grace: I didn't try working with Malabrigo until Alice had already used it for a few projects and she�told me I absolutely had�to give it a try. I broke down and got my first skein of Malabrigo when�I saw a skein of Worsted Glazed Carrot being destashed on Ravelry. I used it to knit myself a Koolhaas cap and it is still one of the softest things I've ever knit. Is there a color you like most? Grace: In my book nothing beats Frank Ochre! What is your favorite Malabrigo Yarn line? Alice: What a toughie! �I recently used Twist for the first time and it was even dreamier than I expected. �I don't know if anything can compete with my love for good ol' Worsted though. Grace: I have to agree with Alice. Worsted is my go to yarn! It's so versatile, soft, and the color selection is just unbeatable.�I think�Silky Merino and Sock are very close runners up. Why do you use Malabrigo for so many projects? Alice: There is a Malabrigo yarn that is perfect for every type of project. �The quality and beauty of the yarn really elevates my knitting as a whole. �Plus, the yardage and range of colors can't be beat! Grace: Once I started using Malabrigo, most of the�other yarns I had just�seemed so rough!�Each skein of�Malabrigo, no matter the type, always feels so luxurious as you knit with it and�I usually don't want to set my project down until I've finished. What is your favorite project to date made out of our yarn? Alice: It seems like I love each thing I knit with Malabrigo more than the one before... though I do have a major affinity towards the sweaters I've knit my daughter. 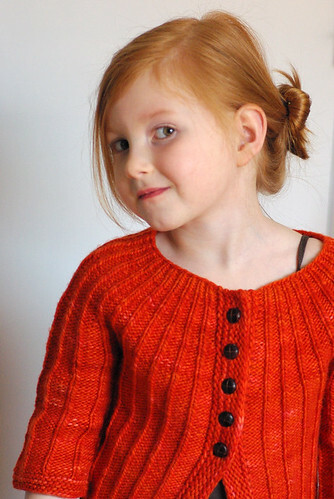 I especially love the Yoked Cardigan I knit her in Glazed Carrot during Malabrigo March earlier this year. 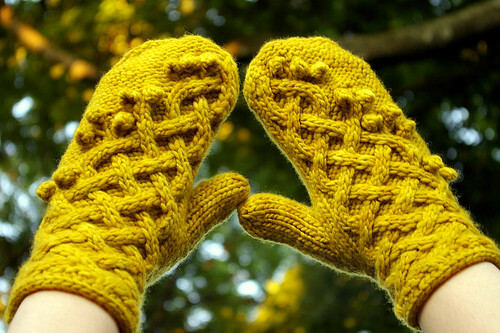 Grace: My favorite project would have to be the the Robot Mittens I designed in Worsted. 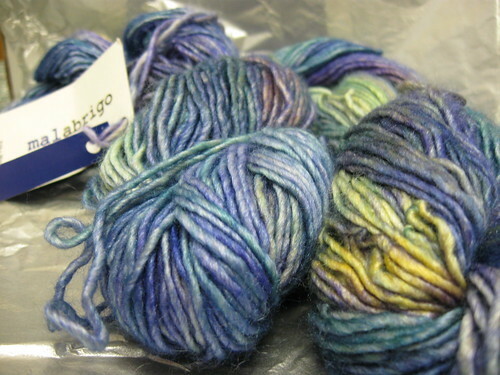 Malabrigo yarns look amazing in colorwork and the fabric�is soft and squishy. Alice: I enjoy browsing around Ravelry, especially the FOs thread on the Mal Junkies board, which always has quality knitting to drool over. �I also enjoy the outdoors and gather a lot of inspiration from the colors and textures you can find in nature. Grace: I love looking at antique textiles, samplers, needle points, and Native American weavings. A lot of the designs can be translated into modern knits. Ravelry is also a great resource of information and browsing all of the different projects can be overwhelmingly inspirational. However I probably get most of my inspiration from my sister, Alice. We have a great time bouncing ideas off each other! 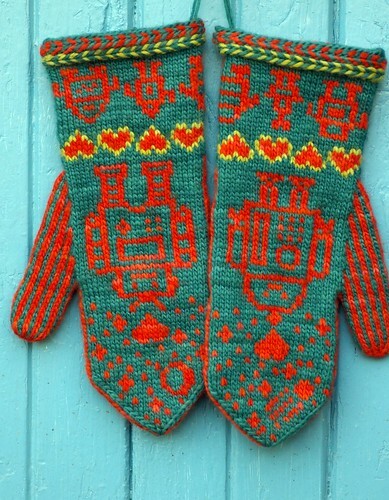 Alice and Grace released a pattern this year in Malabrigo Worsted -- colorwork mittens with a robot love theme (click the picture below to go to the Ravelry pattern page). Their projects are always lovely examples of creativity and application - the right yarn and colors for ever knit! You can check out their blog at http://www.kathrynivy.com and read up on all their awesome work! This entry was posted on 9th July, 2010 . This entry was posted on 7th July, 2010 . [caption id="" align="alignleft" width="264" caption="Photo Property of Knitter's Review.com"] [/caption] If you're as avid a knitter as I am, you'll be well aware of Knitters Review, the website that reviews products, yarns, and lots of knitting notions to see how they fare in different situations so that you can always read before you buy. They have a lot of wonderful reviews for all brands of yarn -- including many for Malabrigo, but recently I checked to see that they've added a review for Malabrigo Twist! It was wonderful to see that the review was so favorable, and it's a real honor for us to have a yarn so well-loved in any knitter's opinion. But no need for me to wax poetic here - read it yourself! Knitter's Review, Malabrigo Twist. This entry was posted on 28th June, 2010 . Malabrigo Lace #37 Lettuce, pattern by Hannah Fettig "Lettuce Pullover"
This entry was posted on 19th June, 2010 . There seems to be a sudden rash of Malabrigo headwear in the new patterns on Ravelry! If you're as excited as we are about it, be sure to check out some of these lovely new patterns from various designers on everyone's favorite knitting website (aside from this blog, of course!) Click the linked name of the pattern below to go to the pattern page. This entry was posted on 14th June, 2010 . This entry was posted on 3rd June, 2010 . This entry was posted on 28th May, 2010 . Kristin Omdahl�began promoting her book this week�with an advance copy. Here is a link to the first video she produced to�promote the book. This entry was posted on 20th May, 2010 . Ube You can find this lovely pattern at Knitter's Magazine. It is made with�8 skeins of Malabrigo Yarns Silky Merino �(color #425 Madre Perla) Designed by Kathy Zimmerman. This entry was posted on 13th April, 2009 . This entry was posted on 3rd April, 2009 . We just received a copy of the new Sally Melville book, the book is Mother-Daughter Knits, 30�Designs that Flatter and Fit and it has a Malabrigo Pattern on it!�a beautiful book using beautiful yarn ;-) � Also I was told that the September-09 issue of Creative Knitting will be featuring Malabrigo Yarn in a project.